Announcement: Our board of directors has decided that the shelter will be open by appointment during the winter months. 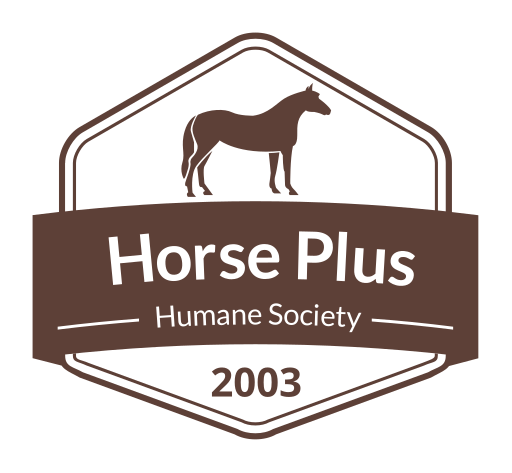 The safe surrender site at Look Ahead Vet is still available for anyone wishing to surrender a horse during normal business hours. The shelter will be closed on Sunday’s unless you have an appointment this winter. We apologize for any inconvenience. On Friday Eoo’s got to see his mom again. His smile must have worked because she came to take him home. They looked so great together as they posed for their adoption photo. He is such a majestic looking horse. 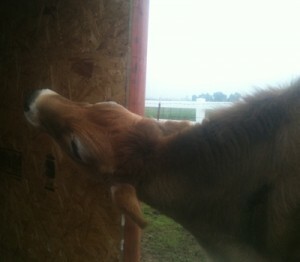 Eoos is the stallion that was surrendered by Yuba County Animal Control a month ago. 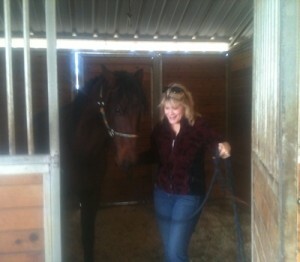 He had his gelding operation thanks to your support and was ready for his forever home. 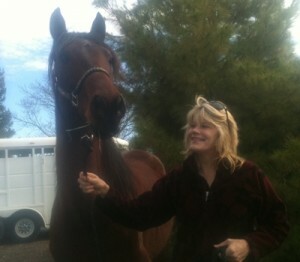 He will be heading to the trainer to learn how to give his mom great rides soon. 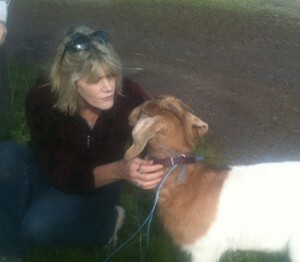 A little goat who was surrendered was at the vet, her name is Fin. Eoos’ mom fell in love with her and adopted her too! 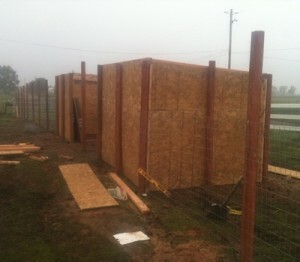 Sunday morning found the staff and volunteers busy at work getting the little critter pens closer to being finished. 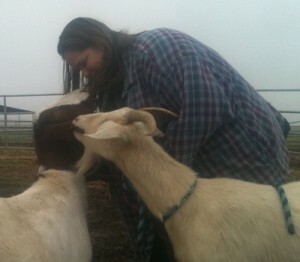 Everyone was hoping to get at least one done for the goats. Parcy looked on with interest wondering if they were doing all the hard work just for him. 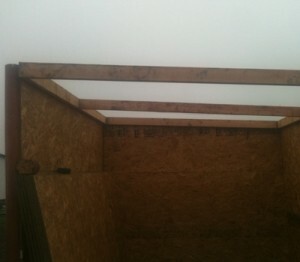 Finally the rafters were being put in. 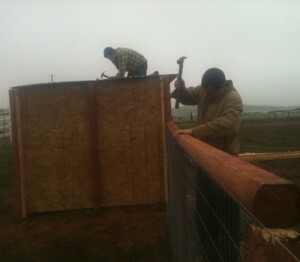 Then while one guy was screwing down the sub-roofing, Jason was busy putting the top rail on the fencing. Parcy kept watching all through the day trying to figure out what it was all about and what the humans were doing. Finally he figured it out, the humans had gone through all this hard work just to make him a scratching post. 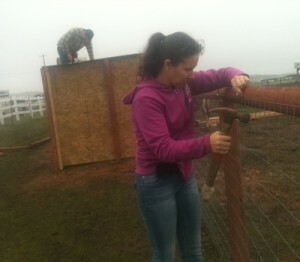 Tawnee continued putting the staples in to hold the fence on tight once Jason was done with the top rail. The group of volunteers that were out last Sunday were out again doing what they could to help. 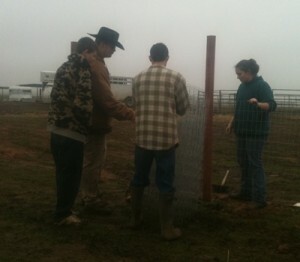 They were a real help getting the fence stretched tight. Finally the pen was close to getting completed. 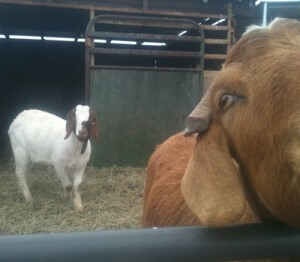 The goats didn’t know it, but they were about to move! Finally it was completed, sort of. The shelter still needs the final roofing nailed down and it needs to be painted, but the paint will have to wait for warmer weather. It looked so nice, just waiting for little critters. 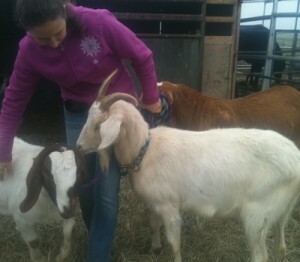 Tawnee went in and put lead ropes on Goaty and Buttercup. 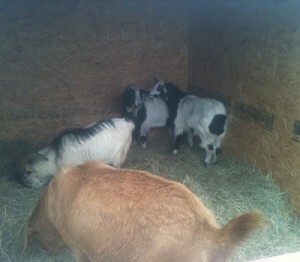 They surprising were not moving over to the new little critter pen, they had a better surprise. They were being adopted! They were so excited to have their mommy there to pick them up. She had been anxiously waiting for her adoption application to be processed, and then waiting for good weather. Today was the day! 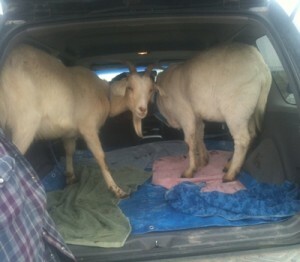 Goaty and Buttercup got to ride home in style. Their mom had layed down the back seats, put some protective material down, and they got to ride home in the heated SUV. We are so glad that they get to stay together. 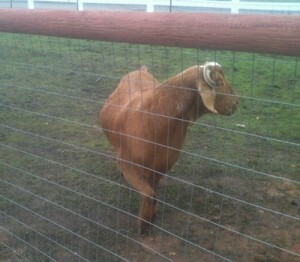 Mr T, however, was checking out the new critter pen. 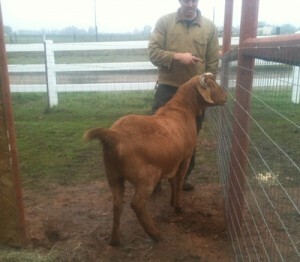 Jason informed him that the fence is not for climbing on, it is just for looking through. 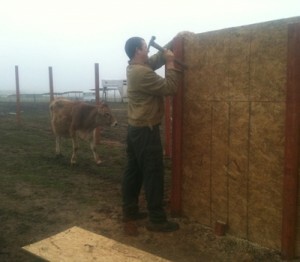 Mr T looked around and gave his approval to all of the humans hard work. 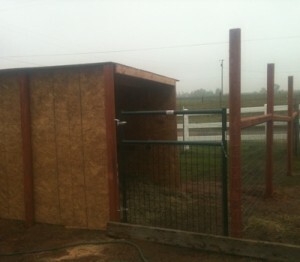 Soon all of the goats were settled in the new critter pen enjoying the yummy food and shelter. 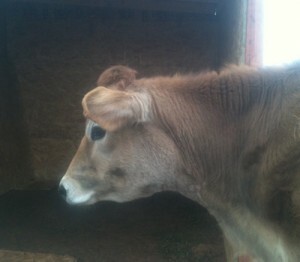 Sir Peanut has joined the herd as well. It’s so nice having the first little critter pen filled with little critters. Don’t forget to vote for us every day! 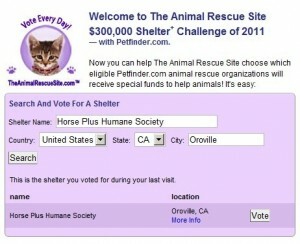 Just click here , enter our name if needed, and vote! The next blog will be on next Monday the 24th, many of you long time blog readers might be able to figure out why. We look forward to bringing our next blog to you next Monday and catching you up to speed what happens this week. If you can figure out why, post it in the comments! Remember we will be closed next Sunday unless you have an appointment. 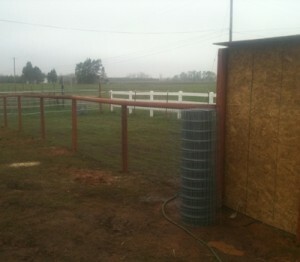 Keep a close eye on Facebook, facebook.com/horsehumane. 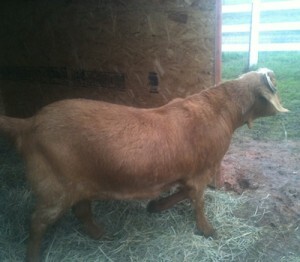 Many thanks to Sheri B. for her generous donations! 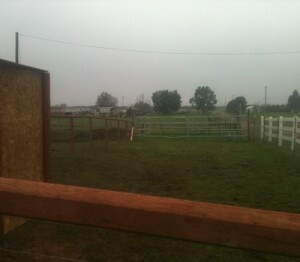 Looks like you guys did a GREAT job with that fence! That wire is a pain to stretch right. You should hire out as professional fencers, I’d hire you! !